AN 85-year-old woman has been granted parenting rights over her granddaughter as courts take a tougher stand over denied access. With a rising number of so-called “grey-sitters” left raising grandchildren, the Full Court of the Family Court of Australia has reaffirmed the notion of “parents and non-parents” having the same legal rights to children. The appeal case involving access to a nine-year-old girl after her mother died of breast cancer in November 2010 follows another “heart-wrenching” decision to grant custody of a two-year-old boy to his paternal grandmother after his mother was deported last month. And this week, a great-aunt was granted parenting rights over a little girl she had cared for since she was a baby. Queensland Council of Grandparents president Maree Lubach said the rulings highlighted the push for courts to enforce “grandparent provisions” introduced to the Family Law Act. The 2006 reforms uphold a child’s “fundamental right” to “spend time and communicate” with grandparents and other relatives on a regular basis. Despite the changes, Ms Lubach said litigants were continuing to lose their homes and had sacrificed life savings to fund legal bills in excess of $20,000 in the quest to see their grandchildren. “In a lot of cases, they have assets which exclude them from legal aid, so they have lost their homes ” Ms Lubach said. She said the pressure of taking another family member to court took a huge emotional toll. “It is very difficult for grandparents denied access because the attitude is ‘you must have done something wrong’,” Ms Lubach said. “It is hard for them to open up that the threads of their family have been severed. Emotionally, it leaves an enormous scar and that trauma is shared by those raising their grandchildren. 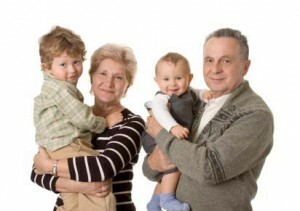 “Grandparents often step in voluntarily or are asked to raise the children for a while. They form bonds and then the children react to being expected to start bonding with parents they were alienated from. Leading family lawyer Dan Bottrell urged grandparents to pursue access even in difficult circumstances. “Just being the biological parent doesn’t give you the preferential treatment,” Mr Bottrell said. A Family Court of Australia spokesman said existing relationships between the parents and grandparents were often “critical factors” for judges. “It is not necessarily good for the child . . . if the grandparent denigrates or criticises a parent (and) unfortunately this is something that does happen,” the spokesman said.